Fall cooking, for me, is all about going back to my roots. And yes, I’m getting the puns in my head (no thanks to my MOTHER) about potatoes and carrots as soon as I say that. This time of year I notice my interest in trying new recipes goes down as I go back to recipes from my childhood, things my grandmothers and my mother made for us. Or things I made for them! When my brother sent me an e-mail asking how to make our family “Trunchbull Cake” I thought this might be as good a time as ever to post a review of the children’s cookbooks that I grew up with, since that specific item was created from several recipes I grew up making. Not all of these are great cookbooks – some of them are actually just terrible: bad ideas, bad instructions or just plain bad food. But the contrast will show what makes for a great kids’ cookbook. The best ones here have great standard recipes that have become family favorites and would make great gifts if you’re looking for something special for friends with kids or your own kids. I’m happy to say my mom and grandma had great taste and the ones they got for us haven’t disappointed (except for that one unforgettable failed fudge recipe that came out in shards like burnt glass). The best ones have simple recipes with basic ingredients and helpful illustrations to teach basic skills like measuring as well as clear instructions for each step of the recipe. A range of types of food is good and fun, colorful illustrations or stories make them more fun for kids to browse through (ok, I still like that in my grown-up cookbooks too). The worst ones have illustrations that seem wonderful but are beyond the possible skills of any kids, little to no practical instructions on one hand or complicated ingredients and recipes on the other hand, or are just plain disgusting food. Um, yeah. I want my sandwiches to be filled with vague pink or yellow slime, then topped with ridiculously tiny pieces of hard vegetables in complicated shapes. Adding stems and leaves and a pot will also make this easier to eat, right? There’s a reason why all of these recipes had cartoon illustrations. Also no list of ingredients or instructions. I remember trying a few other recipes from this book and failing every time, frustrated and sad at how entirely different my results were. On one page you have a “humorous” recipe for “Tiger Tail Soup” and on the other hand you have a hilariously complex recipe for Vichyssoise (at least they explain how to pronounce it). It call for 30-40 minutes of simmering, then putting it through a strainer twice, even after it’s boiling – so you need extra tools and you’re likely to burn yourself if you’re not very well coordinated (like most kids). Not to mention the ingredients are costly and the recipe mentions how easy it is to scorch a recipe like this. Potato lovers need this recipe? Really? How hard is it to explain baked potatoes instead, with lots of different toppings for kids to put together as they like? Anybody can scrub a potato and wrap it in foil and microwaving is a perfectly valid alternative for those short on time and/or patience. Maybe I’m just a food snob, but the idea of warming canned potato salad and stuffing it into fried bologna “cups” sounds utterly wretched to me. Scrambled eggs verges on breakfast food at least, if you wanted to pretend this particular processed meat could ever compare to ham. I guess it has the whole “hey, it’s in a fun shape” thing going for it and it has simple instructions, but I’m going to go with “YUCK to the whole decade of processed foods!” and blame the 1970s. This is a great cookbook – with 26 recipes and bright colorful pictures, an older sibling could “read” it to a much younger sibling just for those alone. The recipes themselves have cute illustrations to help explain the ingredients and measurements and the instructions are simple and well organized. My mom bought us one of these by sending in UPC codes from the bottom of Gold Metal Flour, then decided it was such a great book that she saved up the codes to get ones for our cousins and friends too. I honestly haven’t tried many recipes from these cookbooks in a long time simply because we used a few recipes so often they literally fell apart and we filed those pages in plastic holders to keep them intact. I’ve found used copies on Amazon pretty easily since then, fortunately. Oatmeal Pancakes, Lemon Bars, and X-Tra Special Celebration Cake. This cookbook is aimed at the age groups that would be more ready for chapter books. The stories this cookbook is named after are set in the late 1800s or early 1900s and begin with Anne’s misadventures in traditional feminine household duties like cooking, but go on to describe her relationships as she grows up and goes off to seek a career and relationship and so on. The cookbook draws from all of the books, so it includes things she made and recipes mentioned as various neighbor’s or friends’ specialties. These are nice old-fashioned recipes carefully adjusted for modern kitchens. Since so many of the stories ended terribly, this book goes out of its way to start with good advice for beginning bakers, from logistics in getting access to the kitchen to useful tips and definitions of cooking terms. The measurements are given in English and Metric quantities, since the audience is likely to be international (the books are set in Canada, after all). This is my absolute favorite children’s cookbook. My grandmother was delighted to find it and send it to me as a birthday gift because it’s a reprint of the same title she was given when she was young (it was originally published in 1932). I would imagine they’ll be reprinting it for many years to come, since it’s one of those classics that’s both nostalgic but also hard to improve on. Honestly, if I still followed these instructions I’d make my mother a happier woman. They’re good and they’re right inside the front cover. Since I’ve tried pretty much every recipe I can say the Surprise Carrot Loaf is probably best left to the 1930s and the Chocolate Fudge is ridiculously finicky, though entertaining in the extent of the utter failure (I managed to make it into hard, shiny, smoky shards). I also personally think the Cinderella cake is too dry and boring. To properly appreciate this cake, you should be picturing a scene from the movie Matilda with Danny Devito and Rhea Pearlman, based on the book by Roald Dahl. 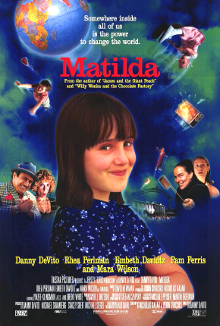 I read this book aloud to my siblings and lost my voice doing “The Trunchbull” and think this is still one of the best book to movie adaptations I’ve ever seen. I found a recipe for German Chocolate Cake in a magazine years ago as a teenager and decided I didn’t like the bland version of the cake, even if I liked the filling. So I combined the caramel and coconut filling with the cake from Alphabakery and put on the fudgy frosting from the Anne of Green Gables cookbook on the outside. It was definitely a success. The only problem was we finished the entire cake in one sitting and then had our weight check-ups the next day. Mysteriously everyone in my family had gained exactly 5 lbs., so we joked it had been the “Trunchbull cake” – actually the cake recipe is pretty low-calorie and I have a quick microwave chocolate glaze recipe that’s also pretty light. So here are two versions – the rich, traditional “Trunchbull” recipe and the “Lite” version (which I suppose I should call the Miss Honey cake if I were following the story, but that’s confusing since there’s no honey in it). This is actually a pretty “light” cake, and it’s also vegan since it uses oil and no eggs or milk. Using vinegar and soda for leavening makes it more fun for kids, since you get a bit of fizzy action as you stir the batter together. Heat oven to 350 degrees. Grease 2 round pans and dust with flour (see link for video demo). Sift together or mix dry ingredients in a large bowl (if you don’t have a sifter). Mix together oil, vinegar, and vanilla and add water. Stir into the dry mixture until well blended. Divide batter between pans and bake for 35 minutes. Let cool for 10 minutes in pan. Remove from pan and let cool completely before frosting – sticking the layers in the freezer can also be helpful. This literally tastes like fudge, but it’s also thick like fudge so you need to be sure your cake is cool or it will break up as you add the heavy frosting. If you like shinier frosting, dipping your knife or spatula in water as you spread it on will leave it looking glossier. If you don’t want the German Chocolate filling, double this recipe to have enough frosting. Oh, and it’s also vegan! from Anne of Green Gables Cookbook, page 42. Make sure you stir the shortening into the chocolate chips before putting them in to the pan or microwave. Shortening has a higher melting point than butter and will make your chocolate nice and liquidy, though you might try reducing the amount here and see if it still gets runny enough to stir in the powdered sugar. NOTE: Melting chocolate can be a bit tricky – I like to do it in the microwave in very short bursts (start with 30-4o seconds, then stir every 10-20 seconds as you see it start to melt). To do it on the stovetop, it helps to use a double boiler or put one pan or bowl into a bowl of boiling water (also called a bain-marie) – keeping your pan from directly touching the heat will make it much easier to keep it from burning the chocolate before it’s all melted. When the chocolate is all melted and runny, stir in the powdered sugar a little at a time, adding milk as needed while keeping the mixture warm (microwave again in small bursts or keep in the pan on the stove). When it’s all mixed together, it helps to beat it for about 5 minutes with an electric mixer to get it really creamy. See note above for shiny frosting! This recipe was copied out of an old magazine – it uses butter and coconut, so you could easily skip it and use twice the amount of fudge frosting above if you liked instead. Combine all ingredients together and spread between layers of chocolate cake. If I want a quick easy chocolate cake or need a “light” recipe for frosting, this works fine. It’s more like a thickened chocolate sauce than a traditional frosting, but it is very shiny and rich looking. In a microwavable bowl or a medium saucepan, combine sugar, cornstarch and cocoa. Mix in boiling water and salt. Microwave 2-3 minutes or heat until it comes to a boil. Cook 1-2 more minutes, or until it is thickened. Stir in butter and vanilla. Spoon over cake ( you can put this on warm cake, which also makes it faster to put together). For Trunchbull cake, bake chocolate cake in 2 layers and prepare frostings while the cake cools. Place the caramel filling between the layers and put it in the freezer to firm up. When chilled, spread chocolate frosting over the layers. For the Quick & Easy (and healthier) chocolate cake, bake the chocolate cake and work on the glaze while it bakes. Spread the glaze over the cake as you transfer it to a plate and you’re ready to serve.